The Crawford Fund’s ACT State Committee is proud to have sponsored six 2016 scholars to attend this year’s annual conference on ‘Waste Not, Want Not: The Circular Economy to Food Security’. The ACT-based scholars come from Charles Sturt University, Australian National University and CSIRO. Click on the links below to view their conference reports, which summarise their overall impressions of the conference. Attending the Crawford Conference as a scholar was the most exciting experience I ever had at any conference. I believe the best part of the conference was the wide range of networking and especially scholar-mentor linking. To be encircled by people of various ages, expertise, and similar interests, was a new yet attractive event and made the few days in Canberra all the more enjoyable. To be honest I had never heard of the Crawford Fund until a few months prior to the conference. After attending the CFC I felt bad that I was unaware that such an important conference was occurring each year with some very powerful speakers attending from around the globe. When I did the application to the conference scholar program I was determined and knew it would give me the great chance to network and learn the national and international perspective of food security and safety. It was a great experience to meet with the diverse group from all states young, early career and higher leadership made the conference environment very informative. I really like the Professor Louise Fresco, Sir John Crawford memorial address. Her speech was excellent and her passion for work and her vast experience working with a leading organisation of the world made her very inspiring personality. The most important take-home message from her speech was about the one-third of food wasted or lost every year—and the most food waste and loss is near the fork in developed countries and near the farm in developing countries. Her enthusiastic speech made me think how we can reduce food wastage and the extra food in developed countries can be supplied to the undernourished people of the underdeveloped world. Linking with the RAID network. In a nutshell, this conference added up enormously to my professional network and gave me great insights. Thank you so much, Crawford Fund, for supporting me as a scholar to attend the conference and big thanks to Tony Fisher for being my mentor. The 2016 Crawford Fund Conference covered almost the full spectrum on food production and agriculture and the topics were very well organised in central themes. The case studies from India, Kenya, Asia Pacific and Australia highlighted the practical approaches to quantify and address losses in food production; whereas general overviews on global circular food systems, on-farm loss and mega cities enable us to put things in perspective and identify target areas for future direction and resource investment. It was fascinating to discover new facts and figures associated with food losses and ways to minimise losses which are highly context-dependent. There is no one size fits all solution, and for me this is the exciting part of working in agricultural research or industry. Everyone can contribute their expertise to the advancement of agricultural research or industry in many different ways. I will continue to polish my skills and find my niche in this field, echoing the recurring message of being ‘a jack-of-all-trades and a master of one’ I heard throughout the conference. I also had the opportunity to speak with the conference attendees (speakers, RAIDers, Crawford Fund scholars as well as with the Crawford Fund Committee members) about potential career paths that I was not aware existed. I received excellent career advice; one of them was to reach out to the Center for International Forestry Research (CIFOR) and The World Agroforestry Centre (ICRAF) which conduct research on improving agricultural and forestry practices for better livelihoods, an area in which I would love to work in the near future. I initiated contacts with a few individuals affiliated with CIFOR and ICRAF and I would like to convey my gratitude to Crawford Fund for providing me a platform for quality exchanges. Attending the 2016 Crawford Fund Conference was like going to a crash course on international agricultural research. One of the reasons I attended the conference was to broaden my horizons and foster new connections with key figures in international agricultural research—and indeed the conference offered a diverse range of experts in international research, organisations and firms as well as local key players in agricultural research and development. Trained as a plant physiologist, I know how to navigate my way smoothly as I know who’s who in my field. During the conference, however, I found myself struggling to figure out my way around and I put myself under intense pressure to make the best out of the amazing opportunities presented. Having the RAIDers and a mentor (thanks to my great mentor Dr Tony Weatherly) around was definitely helpful; and they introduced me to experts in the field whom I would not have met otherwise. I think it would be great if a full list of conference attendees is provided before the conference so that someone like me, who does not have much experience in international agricultural research, could do quick background research on the experts available during the conference. 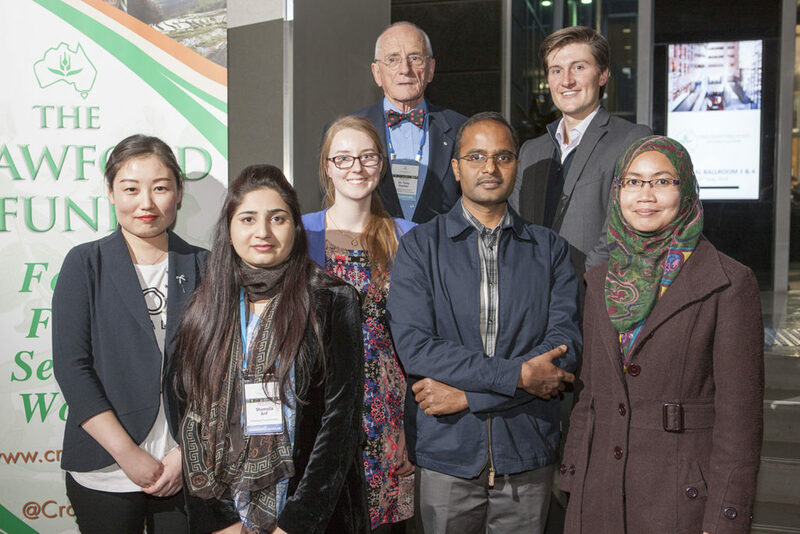 The 2016 Crawford Fund Conference ‘Waste Not, Want Not: The Circular Economy to Food Security’, was an inspiring and uplifting opportunity to learn from the best and brightest in international agricultural research. As a female student I really appreciated the number of female speakers from high profile positions around the world. Keynotes such as Louise Fresco were incredibly well-spoken and brought a lot of knowledge to the discussions. I now have a longer list of role models to look up to! In addition, the best part about being a scholar was the opportunity to gain mentorship from a professional in the industry. Gaining a connection to someone with real-world advice, networks, and lived experience was a clear highlight. I also felt a greater sense of involvement during the conference, and my mentor helped to expand my network in ways where I would have individually fell short. They also provided helpful guidance during the scholar’s days, and I am incredibly grateful for all they and the Crawford Fund have done to help further my interests in international agricultural research! I am extremely grateful and cannot thank the Crawford Fund enough to have been offered the opportunity to attend the 2016 conference “WASTE NOT, WANT NOT: The Circular Economy to Food Security”. I cannot recommend the experience highly enough to any interested student or early career researchers interested in the area of global agriculture. I have spent most of my research career focussing on the production and yield elements of food security. In contrast, the conference provided me with the opportunity to hear about projects successfully addressing food waste in developing countries, which I found very interesting and inspiring. I was particularly impressed by the benefits of addressing the issue of post-harvest food loss in developing countries. People are our most valuable resource, one which we can least afford to waste if we want a food secure world. Different backgrounds provide unique perspectives and solutions and it is essential for all stake holders including agronomic researchers, social scientists, governments, volunteer organisations, local communities and businesses, to work together. To reinforce this message, key note speaker Professor Louise Fresco, emphasised the importance of being a ‘jack of all trades and master of one’ in order to most effectively work within a multidisciplinary team. Mr Simon Costa gave a powerful presentation recounting his work in sub-Saharan Africa. The result was successful uptake of on-farm storage, education and support for farming families. For me, the key messages were: to address the problem not the symptom; food is at the root of making poverty history; and to back yourself despite popular opinion and advice to the contrary. Other speakers emphasised: the impact of cheaper and more accessible digital technology on identifying as well as solving problems (Mr Salesh Kumar and Dr Washington Otieno); the importance of realising the nutritional and economic value of food as well as accounting for the environmental impacts of food production (Dr Karen Brooks); and the opportunities for novel products from so-called waste, such as phosphorus recycling (Dr Dana Cordell); Novaq (Dr Cedric Simon); and anaerobic digestion (Dr Bernadette McCabe). During the scholars’ day, I was impressed by the energy and passion of volunteers and researchers working in developing countries. Through their drive, creative and innovative solutions are being developed and their enthusiasm is contagious. To summarise, I found the experience thoroughly rewarding. My perspective has been broadened and there is a wealth of opportunities to pursue for either future research collaborations or career. The exposure to the range of agricultural research occurring in developing countries was highly valuable, especially at this point in my career. It was a thrilling experience to be part of this large and very important gathering aimed to address global food security issues. Thanks to all the world-renowned speakers who highlighted the importance of food waste as the primary issue for hunger and poverty, though we scientists blame shortage of food (at the production end) as the key factor. I truly got motivated with the talk from Prof. Louise Fresco—what a rare personality in this competitive world who can address the world’s most important and emerging issue “Food waste” for nearly an hour without a single reference (to a slide or any hand notes). Next is the talk by Mr. Simon Costa, who made the whole audience go silent throughout his talk. Surely I am not the only one to get motivated by his speech to visit Africa within the next couple of years to visualise what the daily life means to those poor farmers. Next I enjoyed listening to Prof. Ashok Gulati’s talk who pictured the real world problems faced by the farmers in the highly populated India and their lack of awareness of market fluctuations. I enjoyed listening to Mr Daniel Lagger from Nestle who highlighted the on-going and future strategic plans of this giant company to minimise waste and recycling. Thanks to the Crawford committee for making such great efforts in bringing diverse expertise to one spot and for covering the whole range of issues related to waste management. Being greatly benefited and motivated, now I am encouraging all my fellow students and colleagues in the team, as well as outside CSIRO, to attend at least one Crawford conference in the near future. Subsequently, the Crawford Scholars’ Day program is a great event to hear the experience from the super stars who have dedicated their time to help people in desperate need. Particularly, the support and the encouragement from the well-experienced mentors truly motivates us to be part of this volunteering network in the future. I am a Crawford Fund sponsored scholar for 2016 Crawford Conference: ‘Waste Not, Want Not’ from the ACT group. I should say that I have been impressed by the 3 day conference from the beginning to the end. I have never participated in a conference like this before. Not only were the invited speakers amazing, but also all the themes of the conference were related. The volunteer experiences in developing countries was the one that surprised me the most. When I was thinking of this new information I gained from the conference, I wondered what would be useful as a reflection report from me. Then I decided maybe it is better to tell a story about myself. Although I am currently a PhD student who is focusing on genetically cloning an alien wheat stem rust disease resistance gene “Sr26”, I also have more than 8 years working experience in a private sector wheat breeding programme in China. I joined the company immediately after I graduated from university with a background of public management and administration. It was not long before I realized how science improved the wheat breeding program of the company and how high yield varieties benefit the rural farm communities in Henan province, the largest wheat producing province and the second biggest province in terms of population in China. My daily duties involved intensive interactions with agronomists, scientists (international), wheat breeders, technicians, dealers, and the most important end users of all agricultural technologies—the wheat growers. The unbreakable link between agriculture and I began in 2006, when I eventually got a scholarship for studying abroad and decided to undertake advanced studies in Agriculture, particularly on wheat rust disease resistance breeding with the support from the company, because stripe rust became a severe problem to the wheat industry in China, especially Henan province, and the potential threats of wheat stem rust race group Ug99 (TTKSK) spreading to China. I enrolled in the Plant Breeding Institute of the University of Sydney for a Master’s degree in Agriculture that allowed me to undertake both coursework and research project work at the same time. What I would like to mention is this period of study was supported by an international training support programme from the Chinese government. After I successfully completed my study at the University of Sydney in 2008, I went back to the company and took the position of crop breeder. Actually, during the discussion on the first scholar day, on how the international volunteer programme will impact, my personal experience reminded me that these type of volunteering activities have another side impact—the impact to the local people who are able to interact with the volunteers. Sometimes this type of interaction and all the communication may be able to change the whole life direction of both parties. Therefore, given this background, I always have had the passion to make a contribution to improve the livelihood of farmers in developing countries, including my home country China. With a better understanding of the advantages of advanced biotechnologies, especially the availability of the wheat whole genome sequencing information, and the broader view of the agriculture industry from many years’ experience working as a crop breeder in the industry, I have a clear understanding and reached a conclusion that these technological advances have the potential to revolutionize whole staple food breeding research. By building on the experience from both sectors, I am passionate in creating a pipeline of easy, fast and efficient delivery and application of new technology among the research community, crop breeders, and growers. Also, from the conference, I am so glad to see that many people are actually doing this. In conclusion, after this conference, my feeling is that I am almost mentally ready to participant in the great activities of helping agricultural development of developing countries, and it is also my longer-term ultimate career objective.